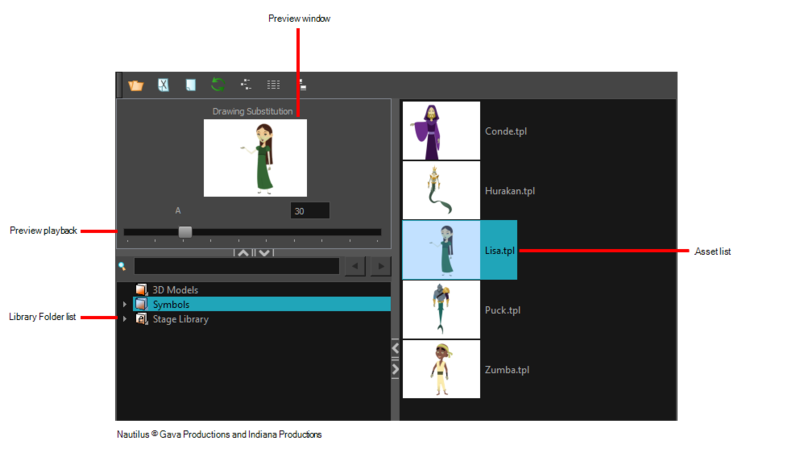 The Library view is used to store elements such as animation, drawings, backgrounds and puppets to reuse in different projects. You can also use the Library view to create and store symbols. To reuse an element from another project, you must create a template from your drawings. A template is a mini scene that you import in other projects. A template has no link to the original scene. When you create a template, the full content of your selection is copied in the template. Harmony Library: This is a default folder found on the hard drive in your user documents. This folder can contain templates, but no symbols.